The Mont Cervin Palace is situated in the heart of the car free village of Zermatt and only 5 minutes away from the train station. The cable cars to the skiing area are reached within walking distance. In front of the hotel, on the Bahnhofstrasse you find sport and souvenir shops as well as shops with international labels and brands. Since 1851 the five star Mont Cervin Palace, a member of "The Leading Hotels of the World" and the "Swiss Deluxe Hotels" welcomes guests from all over the world. 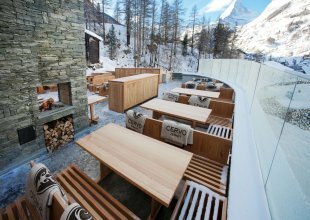 The 5-star hotel in the centre of Zermatt starts the winter season with a new look following a comprehensive renovation. Mont Cervin Palace offers all of the convenience and special facilities that you would expect of a 5-star hotel. The sense of anticipation grows as you plan your holiday, including a preview of the stylish accommodation at the Mont Cervin Palace. There are three room categories to choose from: Alpine, Chalet and Chalet Family. Dine in style every day enjoying many different cuisines; traditional Swiss dishes, Mediterranean treats, classics of French cuisine, selected Japanese delicacies and much more besides... Choose from the varied menus in several restaurants and dining rooms. The spa and wellness area covers 1700 m2. On the first floor, the MCP Spa proposes various massages and very exclusive beauty treatments. The Mont Cervin Palace facilities include a swimming area with indoor and outdoor pool and a separate children’s paddling pool with slide, saunas and steam baths, whirlpools, solariums and a fitness room. All rooms at the hotel and the Residence have been fitted with a modern communication system. Such as cable TV with pay-TV, direct internet access and Public WiFi. The largest and one of the finest hotels in Zermatt invites you to restful and eventful holidays both in summer as in winter. The restaurant is subdivided into three different rooms and seats up to 240 persons. Here we serve a sumptuous breakfast buffet and, in the evening, exquisite dinner options. Dinner is served in a festive ambiance, supported by our clients by dressing appropriately. Jacket and tie are required for gala dinners on Fridays. Our prices are quoted per person based on two people sharing an "Alpine Classic" room, always including a sumptuous breakfast buffet, service and VAT. Other room types available and quoted on request. Dinner at the hotel is compulsory during high and peak season weeks. At the Mont Cervin Palace, the south facing rooms and suites offer a fantastic view of the Matterhorn. The view to the north is also amazing overlooking snow covered peaks of more than 4 meters altitude. Fine materials, bright colours, luxurious comfort and every 5-star convenience – these are the features of the “Alpine” category rooms and suites in the Mont Cervin Palace's main building and the Villa Margherita. The "Chalet" rooms feature cosy wood, warm colours, lovingly detailed furnishings and perfect 5-star comfort – these are the features of the rooms and suites in Le Petit Cervin. The "Chalet Family" rooms are spacious, with Mediterranean colours and cosy 5-star comfort – the suites in the Mont Cervin Palace Résidence are the perfect size for families. Price quoted includes a sumptuous breakfast buffet, service and VAT. Use of the pool and wellness area is also included, as is the transfer from the station to the hotel and back by horse-drawn carriage or electric car! All guest rooms are non-smoking. Use of WiFi within the hotel, transfer upon arrival and departure to Zermatt train station with horse drawn carriage or electro car, use of Nespresso coffee machine and soft drinks from the minibar included. Family package, ski package, honeymoon package, gourmet package and Glacier Express Package available. Prices and availability on request. Please call +44 1202 203650 or make an enquiry.